Sassy Lassie Reviews: Smelly Washers - Be Gone! Smelly Washers - Be Gone! Being the mother of boys, I am quite familiar with the odors and smells that come along with them. Laundry is a never ending drama in this Lassie's house. Did I mention we live on a lake and that one of the boys plays football. You can smell where I'm coming from can't you? Well, between the football stench and the moldy smell in the towels because no one seems to remember to hang them to dry, *ahem*, I am often at a loss as to how to get things smelling fresh around here. Smelly Washer is an all natural way to remove mildew in your towels as well as all those nasty smells in your washing machine. You know the ones..... the ones no one likes to talk about. You can achieve all this freshness with only one Tbsp! 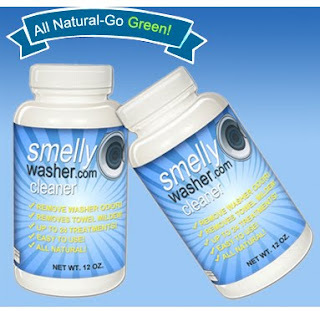 Smelly Washer is also the only all natural washer cleaner available. But could it tackle the nasty smell which is the football uniform?? This Lassie had to put it to the test. I have to say I was pleasantly surprised. While it did take longer to complete the load of laundry, it did get rid of the smells. The only downfall you ask - you have to run it through the wash twice; once with the smelly washer and then again with detergent. You also have to let the clothing soak for two hours and have already completed the 'two day cleaning of your washer step', so you have to have your day planned around de-mildewing your laundry. The perks - no more mildew smell in my beach and bath towels and no worries of the repercussions of trying to get rid of the smell with bleach. You also get a whole year supply when you buy one 12 oz. bottle. Now that is definitely worth it! So what are you waiting for? Go check out Smelly Washer's website for more great tips on eliminating all the odors you!